Design for manufacturing and design for assembly of plastic injection molded components require engineers to walk a fine line of competing requirements. A liquid seal between injection molded plastic components introduces unique challenges. Will the user properly dispose of it? Will users intuitively figure out how to use it? Can the manufacturer package it? Can the manufacturer fill and achieve a reliable liquid seal? Can the manufacturer assemble it? Can the plastic injection mold even form the plastic parts? Can the moldmakers make the injection mold that will produce the parts? A thorough design for manufacturing should answer these questions. In other words, the design for manufacturing engineer does not focus solely on the design for manufacturing questions. Each step brings its own constraints that the design for manufacturing process cannot ignore. We have previously written about Plastic Part Design for Injection Molding and Design for Manufacturing of a liquid seal application. Sometimes satisfying a requirement in one area yields a tradeoff with a requirement in another area. The design for manufacturing engineer must look at the broader system and weigh the risks associated with those tradeoffs. Joseph Juran advocated for Quality by Design where the designer of the product consults with those who will make it, sell it, buy it, and use it. You can read more about how Quality by Design applies to injection molded plastics here. Design for manufacturing serves as the final official design step prior to committing to a plastic injection mold and the accompanying capital investment. This makes the step crucial because any changes preferably happen here to save time and costs. Considering the broader picture requires balancing sometimes contradictory interests. Meeting these competing interests requires creativity. Consider the liquid seal example below. 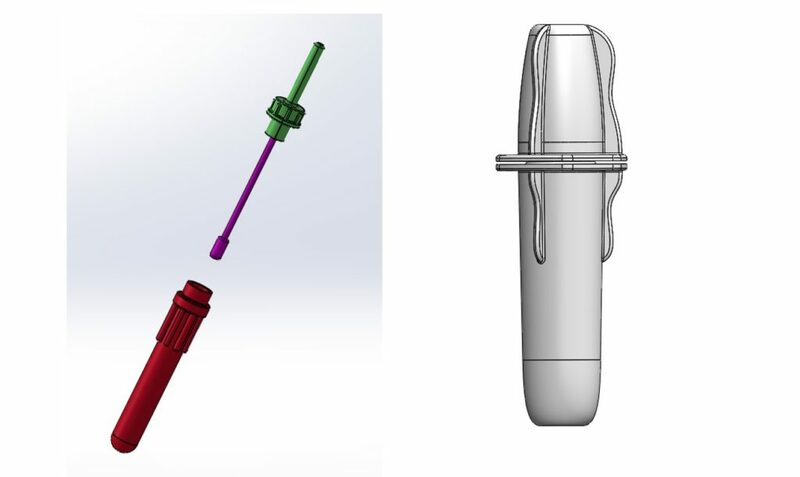 A pharmaceutical client requested design for manufacturing and design for assembly for a presaturated swab applicator with a liquid seal. The plastic device stores liquid until the user opens it at the point of use. 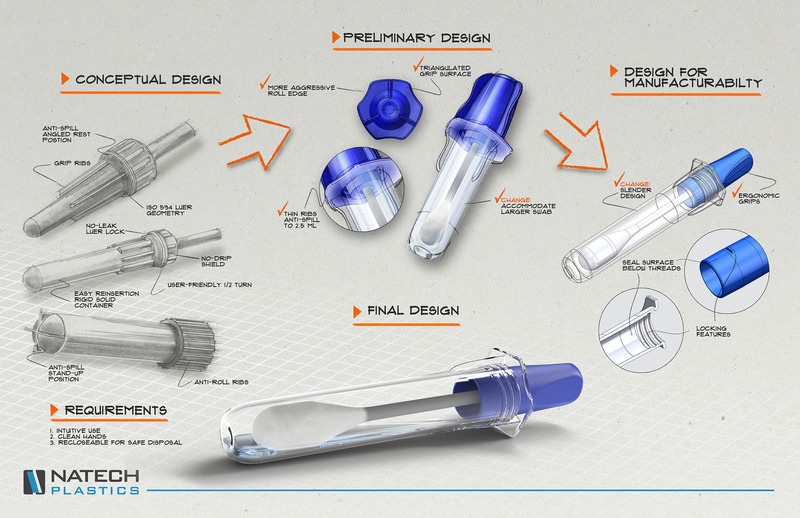 User requirements included being able to reseal the swab for safe disposal using a scaled up luer design. Simply scaling up the luer design had enlarged the plastic device to an undesirable width. This preserved the liquid seal but adversely impacted the part mass, the amount of plastic used, the piece price, usability, and salability. The customer wanted the Design for Manufacturing Engineer to reduce the width while maintaining a liquid seal and the larger fill volume. The client also requested the Natech Engineers perform design for manufacturing with consideration of new requirements for high-speed mass production. This meant the plastic injection molding fill and ejection phases should optimize at higher speeds. Lower speed and lower volume production often accommodate certain risks and lower cycle times that grow prohibitive at scale. The Natech Engineers initiated the design for manufacturing with product research on liquid seals. 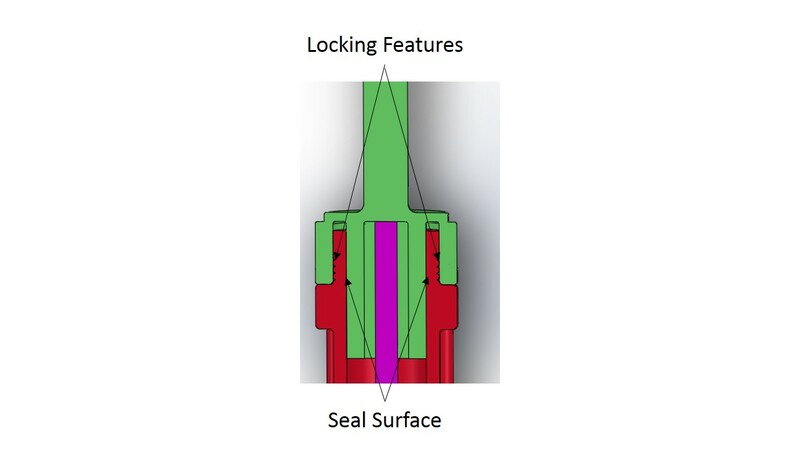 Closures typically achieve a liquid seal along the same surface as the threads. Luers achieve the liquid seal along the inside surface across the horizontal plane to the thread surface. In the image below the threads mate on the outer surface. The inner surfaces achieve the seal. The design for manufacturing solution moved the locking and liquid seal surfaces onto different horizontal planes yet the same vertical plane. 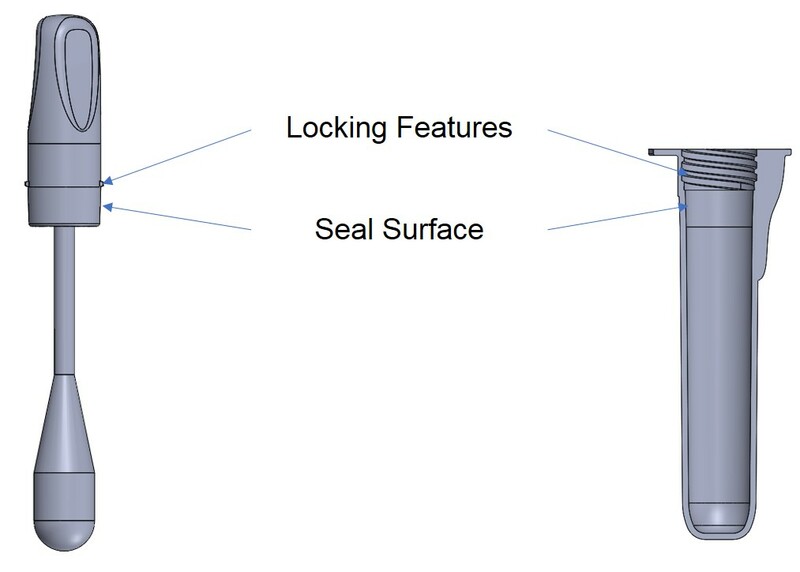 Moving the liquid seal surface below the locking features would manage the risk of spillage, maintain salability and usability, and reduce the outer diameter of the part. The Natech Engineers completed the design for manufacturing with liquid seal testing. After 3D printing prototypes, the team moved into mold design and sampled parts. The parts underwent leak tests and vacuum tests to validate the liquid seal. The leak test samples included parts filled and weighed empty, filled, and after two weeks at 50°C. Vacuum test samples underwent pressure testing from 3 hg to 25 hg. All samples passed the liquid seal tests. This confirmed the achievement of a liquid seal between the injection molded components and validated the design for manufacturing. The client approved the product. The important step in meeting requirements is properly gathering and defining requirements. These two skills can make or break a new product launch. Solving these problems introduces additional skills in risk management, systems thinking, and communication. The design for manufacturing engineer’s weakness in any of these skillsets can increase costs, introduce unfortunate delays, or even completely derail a program. To schedule a Design for Manufacturing review, call the Natech Engineers at (631) 580-3506 or email us at info@natechplastics.com.